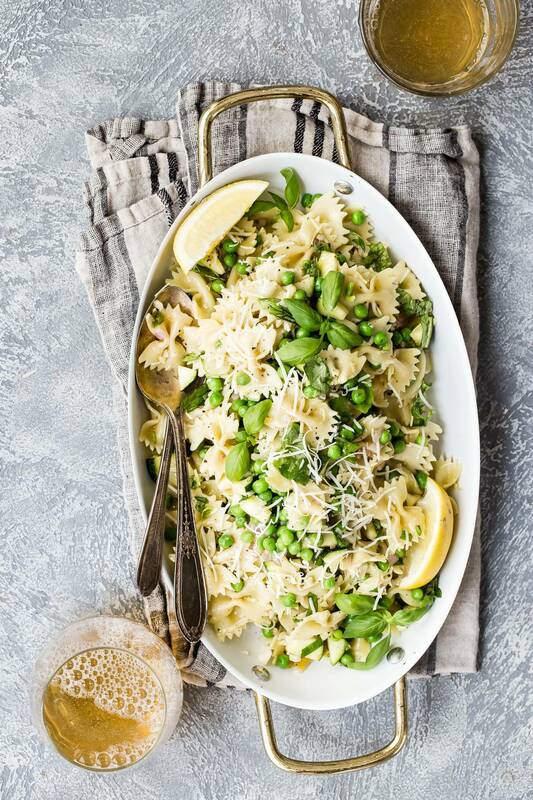 Farfalle pasta with lemon, fresh basil, and peas. This should be your next summer potluck party item! A few weeks ago I posted my grocery shopping items from Trader Joe’s on my Instagram stories. I don’t work for TJ’s but I spend a lot of time in the store mainly because I really like the products and also how often they introduce new items. And if I can pass that info onto you guys, then the rest is gravy. 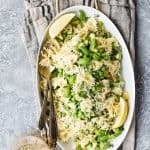 One of the items I’ve noticed for a few weeks now is a lemon basil pasta salad. It’s a simple farfalle pasta salad that you can find in the refrigerated section and it tastes pretty good! So good I thought that I should recreate it for the blog. And here it is, just for you guys. 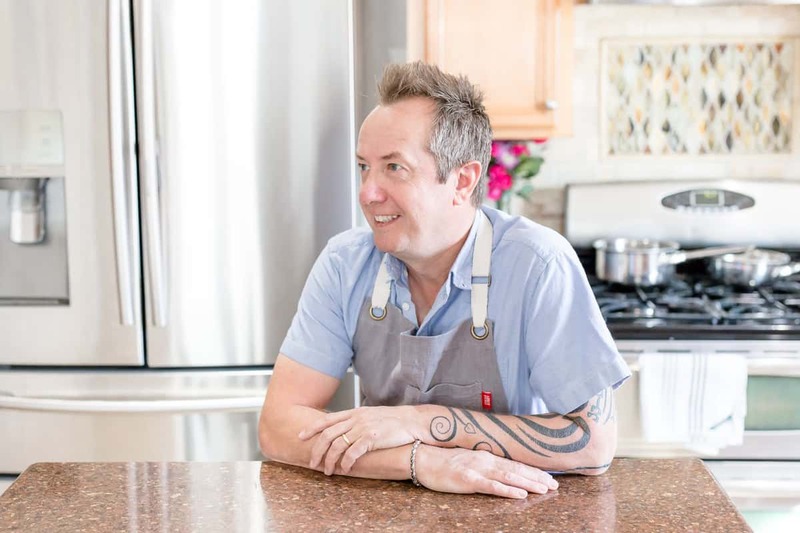 It’s very similar to TJ’s, maybe even better because when you make it at home it’s a hundred percent fresh and hasn’t been sitting on a truck, then on a shelf for a few days. 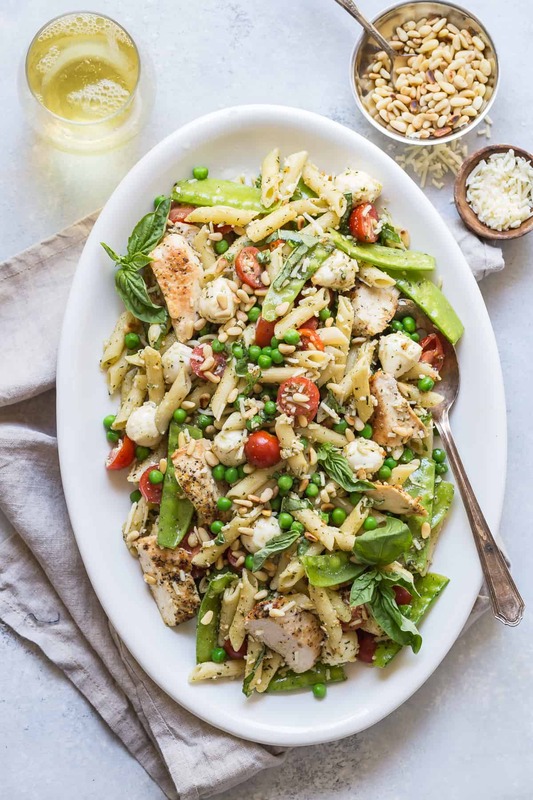 What’s in my farfalle pasta salad? Pasta, obviously, green peas, fresh basil, Parmesan, zucchini, and shallots. The whole shebang is tossed in a slightly creamy dijon and lemon dressing. So simple, right? It’s light and fresh, and packs a good lemon punch for flavor! When should I make my farfalle pasta salad? This is totally a recipe that only gets better if you make it the night before you plan on serving it. With a regular salad, you’d never want to add the dressing until right before eating it. But because the pasta has a lot of body, it can stand up to all of the other ingredients and let’s face it pasta on its own isn’t too flavorful. So any help we can give it is always a huge bonus. Just be sure to cover it completely with plastic wrap or it’ll dry out, and store it in the fridge overnight until you need it. Yes, you can. I don’t know about you and your kitchen but in my cupboard, I usually have at least six different types of pasta on hand, why…I don’t know. Maybe it’s the kids because they can eat enough pasta that would put an Olympic athlete to shame. 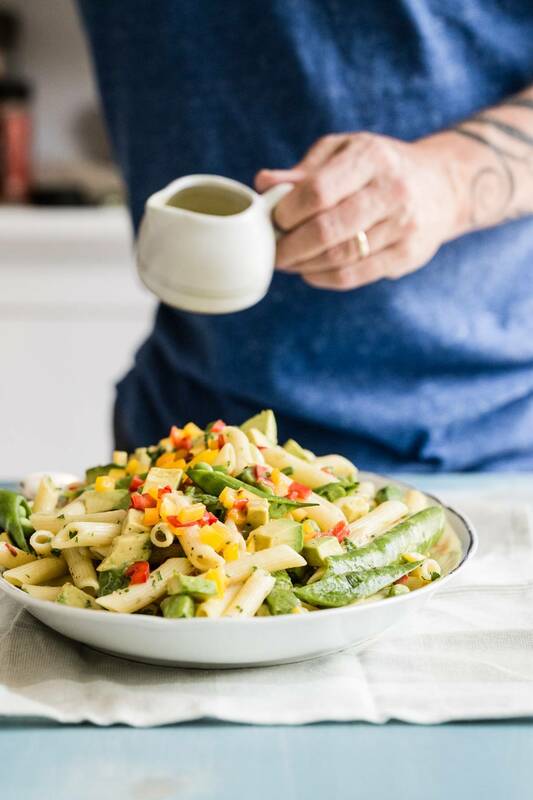 I would try and stick to a similar size pasta like penne or rotini and that way you’ll still have enough dressing to coat all of the pasta easily. Tips when making pasta salad at home. Once your pasta has been boiling long enough, drain it into a colander and then run cold water over it gently moving it around with a spoon or your fingers. This gets rid of the starch that would usually make the pasta sticky and turn into one big clump as it cools. Frozen peas are easy to find and I usually just throw some in a bowl and add some lukewarm water over them to thaw, I don’t even cook them. This way they stay nice and bright green. Don’t skimp on the fresh lemon and basil ingredients. We want this to pop like crazy when your friends put it in their mouths. In my opinion, you can’t have enough, especially the basil. I’m a huge fresh basil fan! Here are some other pasta salads you might be interested in! Cook the pasta in a pot of boiling water as per the instructions on the box. 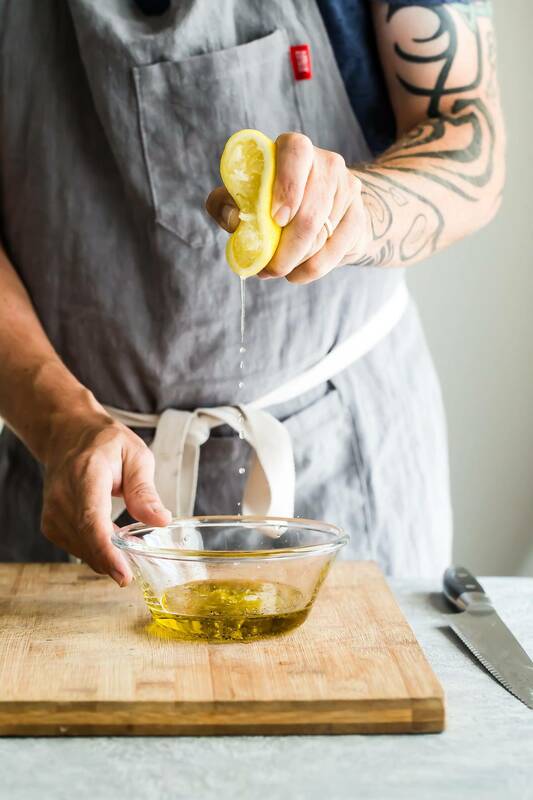 In a small bowl, whisk the olive oil, garlic, lemon juice, basil, salt, and pepper until well combined. Transfer the cooled pasta to a larger bowl along with the peas, diced zucchini, diced shallot, lemon zest, Dijon and grated Asiago. Add the dressing and toss everything together until well combined. 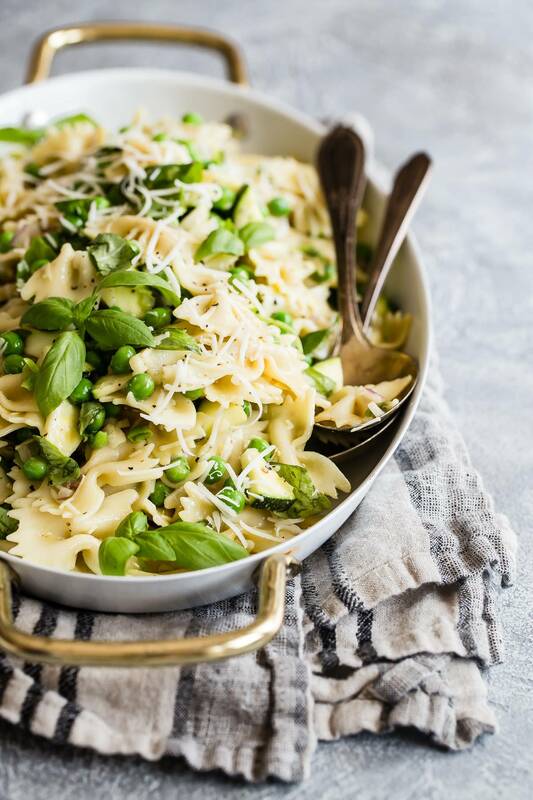 Serve at once and garnish with extra basil and grated Asiago or store covered in the refrigerator. 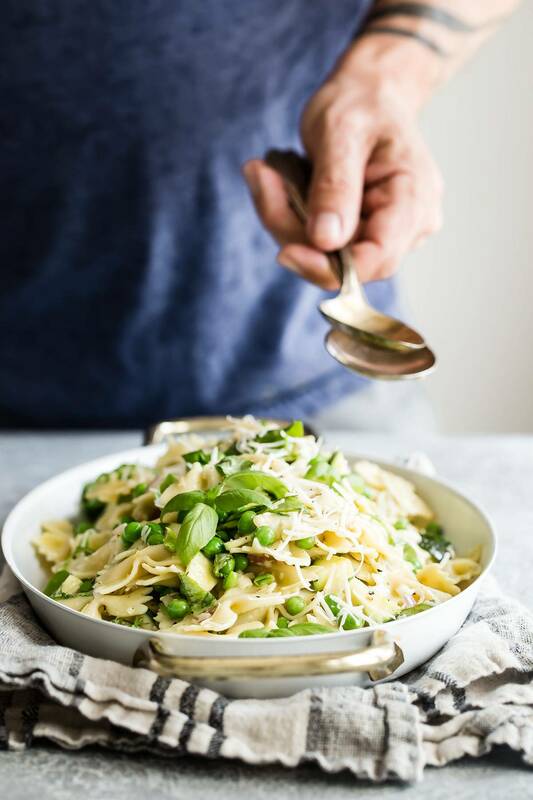 Perfect summer pasta idea, I love the lemon and basil! This simple combination of flavors is so tasty!!! I’d happily eat it all year round. Such beautiful flavors! I’ll be making this for lunch this weekend! So many fresh flavors- I love this! Such simple and yummy flavors! Asiago is one my favorite cheeses to use! Love the fresh veggies with the light dressing. Makes this pasta salad so refreshing!